It seems life has completed full circle for me in last 4 years since when I first time realized through Astrology only that I should become an Astrologer and now today I am writing as to how to see in a chart that a person can be an Astrologer/Occultist/Mystic through Astrology? So, let's start this new series of various professions through Astrology with Chart of An Astrologer/Occultist/Mystic. 1st house - 1st house is always the most important house of any chart as it represents the person and his life path. Moksha House - For any profession related with Occult and Mysticism, Moksha Houses (4th house, 8th house & 12th house) become most important as they are houses of intuition, occult and spirituality respectively. 9th house and 5th house - As these two are houses of Counselors. 2nd house and 11th house - At the end of the day, person needs to make money out of his work to sustain himself in any profession. 3rd house - As it is house of interests, skills, business and communications. Water Signs - Cancer, Scorpio and Pisces, for the same reason that they make person intuitive and give ability of clairvoyance. Scorpio among them is most important as it is sign of occult and mysticism itself. Sagittarius - As it is the sign of higher education, teaching and preaching, it shows how much person is willing to accumulate knowledge and then share with others. Air signs- Gemini, Libra and Aquarius are Air signs and they work to spread the word. So, person should not only have knowledge but he should be able to communicate to others too. Moon - As always, Moon is Mind. Moon's position shows where Mind is working. Mercury - Mercury is karaka of Astrology itself as it represents collection of information, business, communication, memorizing things and quick decision making. All these traits you need as an Astrologer. Ketu - Ketu is main planet of Occult, Mysticism and Spirituality. Jupiter - It is planet of knowledge, wisdom and Teachers. Rahu - Rahu represents our obsessions. So, Rahu position shows where person is obsessed about. Venus - Venus position shows what we love to do. Rahu-Ketu Nakshatra - All nakshatras of Rahu and Ketu are supportive of Occult side of life, especially Ashvini, Magha, Moola, Ardra and Satabhishak. Jyeshtha - It is represented by Round Talisman, makes it closest nakshatra to occult world. Revati - Last Nakshatra of last Sign, represents deepest level of creativity and spirituality. Purva Bhadrapad & Uttar Bhadrapad - As they relate to mystical pursuits, experience and powers. Vishakha - It is considered as good for counselling work. Bharani - As its deity is lord Yama and it relates to death and re-birth, it relates with all occult subjects. Various Combinations - Now, any combination between these houses, planets, signs and nakshatras can create an Occultist. Like, you don't necessarily need a Jupiter-Ketu conjunction or Jupiter in Scorpio or 8th house to say that this person can be in occult field. Even if you have Jupiter in Moola Nakshatra then also it is an energy exchange beiween Jupiter-Ketu. Even if 1st lord and 8th lord are aspecting each other then it shows that your life path can be impacted by Occult. 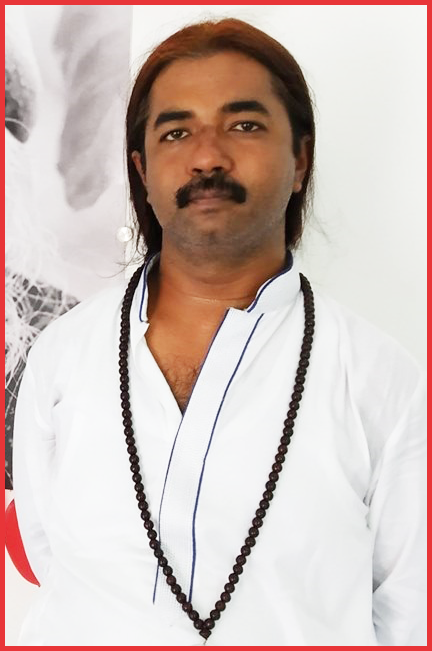 Of course, if majority of planets are in 8th house or Scorpio then it is a clear indication but even if there is a slight indication by combination of 2 planets or 2 house lords which are important here and then person goes through dasha of those planets can bring situation where person thinks of taking occult side of life as profession. So, any combination between these planets, houses, signs & nakshatras where energy exchanges between them can create an occultist in proper dasha time. Atma Karaka or Amatya Karaka - If Jupiter or Mercury becomes person's Atma Karaka or Amatya Karaka, then things can be more prominent to become Occultist as these two planets represent counselors or teachers. Mahadashas - But as always, dashas will activate houses or planets and person will have realization at that time to take up occult as Career. Specially, if Saturn is impacting person's career related houses or planets then things can only manifest with delay in life. 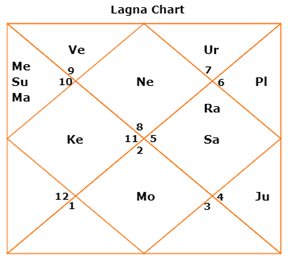 Example Chart - Finally, this is chart of the writer herein who claims to be an Astrologer from last about 3.5 years. I was born on 6th Feb, 1979. 1.30 am. Indore. India. As we can see, I am Scorpio Ascendant, Vishakha Acendant Nakshatra. Venus in 2nd house/Sagittarius/Moola, Sun-Mercury-Mars in 3rd house/Capricorn/Sravana, Ketu in 4th house/Aquarius/Purva Bhadrapada. Moon in 7th house/Taurus/Rohini. Jupiter in 9th house/Cancer/Pushya and Saturn-Rahu in 10th house/Leo/Purva Phalguni. So, we can see that Scorpio in 1st house, Venus in Moola, Ketu in 4th house and Jupiter exalted in 9th house give a strong indication towards a mystical life path. Sun-Mercury-Mars in 3rd house giving me good business acumen as to when to be lenient with people and when not. It also made me more interested in writing then speaking because Mars & 3rd house both represent hands. Shubh Kartari Yoga happening in 8th house between 2 exalted planets, i.e. Moon in 7th house/Taurus and Jupiter in 9th house/Cancer. It helps me to be able to quickly grasp any astrological concept even if I hear it for the 1st time. Moon in 7th house/Taurus always wanted to connect with masses through business of higher education (9th house lord). But as I said, Saturn in 10th house with Rahu delayed my Occult Practices till Saturn maturity age and Jupiter-Mercury dasha from 2015 took me to become a full time Astrologer. It was because Mercury is my Amatya Karaka and lord of 8th house. So in the end, it all looks perfect but in early life, no Astrologer could say that this is chart of a to-be Astrologer. It is not their mistake. It had 2 reasons. 1st was that I was under Rahu MD till 2011, so I was supposed to remain under illusion. Hence, none could guide me as they are also supposed to see what God wants them to see. 2nd reason is that this chart can easily be a chart of a Lawyer where I was working. Mars and Jupiter exalted was enough to take me into legal field. So, everyone thought that I was already doing what I am supposed to do. But Universe has some funny plans reseeved for you. Dear Vishal Sir, Perfect explanation with out hiding anything !!!!!!! Hats off !!!!!!! You have been a GREAT TEACHER and good doer ,I am lucky to have been advised with teacher like you.You are so differently thinking out of the box and trying to go difficult journey in this cunning and commercial world.You always showed us the RIGHT PATH. Thank you for helping me fall in love with learning true VEDIC ASTROLOGY . Wishing you a long life and may flourish your dreams in this Nobel Profession!!!!!!! Dear Vishal Sir,Perfectly explained without hiding anything .Hats off Sir!!!!!!! You are GREAT TEACHER always thinking and sharing your valuable knowledge out of the box. Wishing you a long life and success in your NOBEL Profession .Thanks .